After Shave Balm with Allantoin and natural Menthol is made with organic aloe, soothing Allantoin and cooling menthol to be used after wet shaving. It is made without alcohol to help moisturize and cool the skin without irritation. After Shave Balm with Allantoin and natural Menthol is made with organic aloe, soothing Allantoin and cooling menthol to be used after wet shaving. It is made without alcohol to help moisturize and cool the skin without irritation. After Shave Balm can be used just before shaving for a smoother shave or after shaving to soothe and moisturize the skin. It has a creamy texture that’s lightweight and will not feel greasy. It absorbs quickly and is suitable for all skin types. Daily shaving can be hard on the face so help protect it. After Shave Balm with Allantoin and Menthol is made to be used on the face, but can also be used on dry elbows, heels, hands or knees. Apply a small amount wherever it is needed. If you are a wet shaver you need this After Shave Balm in your daily routine. Ginger’s Garden products are handmade in small batches to assure freshness and purity. None contain mineral oil, parabens or sulphates. 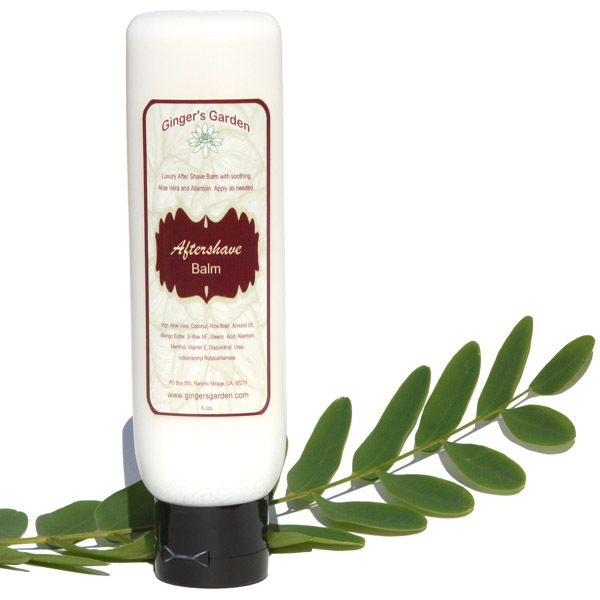 After Shave Balm is naturally scented with cooling, brisk menthol. It is a natural moisturizer that will also soften the skin, help protect your face, mustache or your beard. Ingredients: Organic Aloe Vera, Coconut oil, Rice Bran Oil, Almond Oil, E-Wax, Mango Butter, Stearic Acid, Allantoin, Vit. E, Diazolidinyl Urea, Iodopropynyl Butylcarbamate, Menthol.